I stand in awe…. A gigantic puzzle, with so many pieces lost…. Thanks for a very clear explanation Deborah, and my DNA results are proving challenging, and helpful, in the same ways. I liked how you had clearly set out your initial research too. Wise words. This is one of my real problem branches. It is also the direct line of my father’s mitochondrial DNA through his mother Gladys. We just received his mtDNA results in September. I am hoping to find other cousins through the mtDNA to prove this line. Good luck with the mtDNA! I think that is one of those things that people do not understand about autosomal DNA. I have DNA cousins that I can trace that are 7+ generations back. These are partly due to segments that are passed down generation after generation, unrecombined. They are often referred to as “sticky segments.” Or because of inbreeding in small communities, like any of my old New England, Quakers, or Schwenkfelder lines. I would be worried about lack of a match when you are talking about 1st, 2nd, or possibly a 3rd cousin range. Then that might indicate a birth/parent situation that is not supported by the paper trail, like an unknown adoption or illegitimate child. 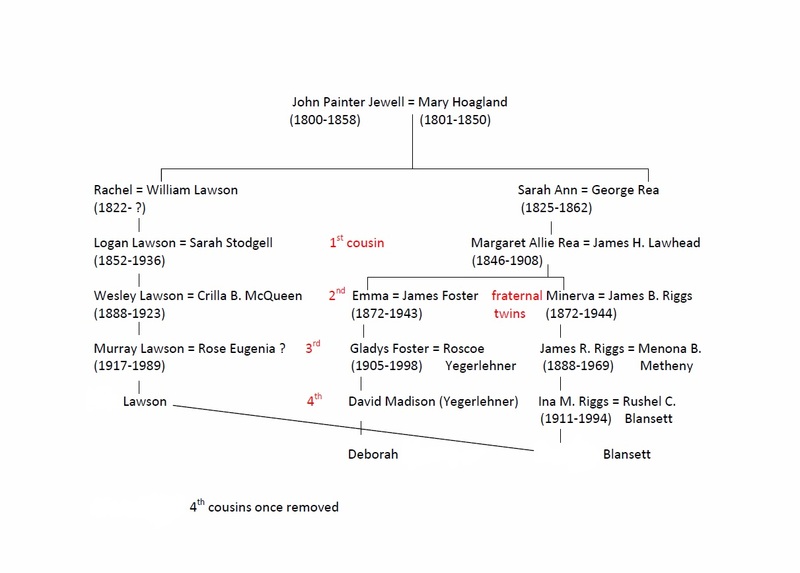 Now there is also the possibility that the Lawson-Blansett connection has nothing to do with the Jewell connection. They might be connected on another branch of their families that has no connection to me. That is why I want to get more known descendants of my branch to test and compare to the Lawson branch. What an interesting and helpful post! Thanks so much for the explanation of the DNA results, and congratulations on breaking down a brick wall! Thank you! I am glad it helped. Studying DNA is fascinating because it is so random and unpredictable at times. I’m still learning but I know there are people who are behind me on the learning curve. I am WAY behind you and really appreciated your clear explanation of why even those who are related might not share DNA.